KTBS/Channel 3/Shreveport reporter Eric James was arrested Friday afternoon obscenity charges. KSLA reports James was arrested in Hamel park along with another Shreveport man. No specifics are being released as police continue the investigation. James was Channel 3' education reporter. Station management had this to say: "We have heard the report of his arrest. We are in the process of gathering more information and investigating the matter. In the meantime, Eric James has been placed on administrative leave." “I’m very pleased with the July numbers,” said Nick Genty, news director at KATV. Genty said he was particularly happy with the station’s 10 p.m. news, which drew an 8.7 rating and a 20.3 percent share, as compared to KTHV’s 7.1 and KARK-TV, Channel 4’s 5.1. 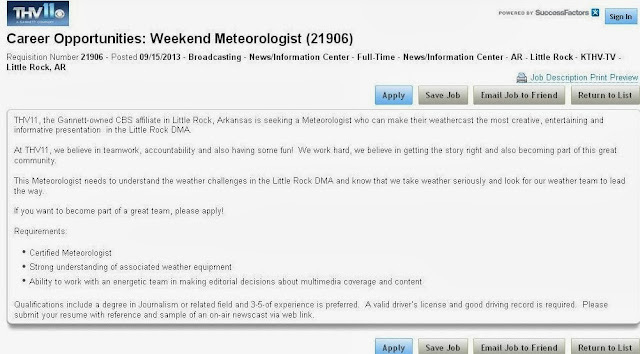 KTHV News Director Dave Parker said the station is working on the quality of its programming. 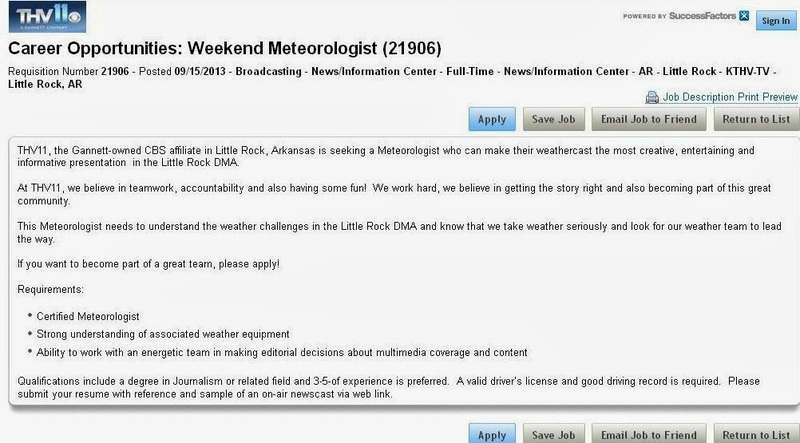 Of course KARK/KLRT can't comment on ratings as they don't subscribe. Brad Carl has been named weekend morning meteorologist and weekday morning reporter at KHBS/KHOG-TV, the Hearst Television Inc. ABC affiliate serving the Fayetteville and Fort Smith, Arkansas television market. With Carl’s addition, 40/29 News will be the only local television station in the market with four meteorologists. 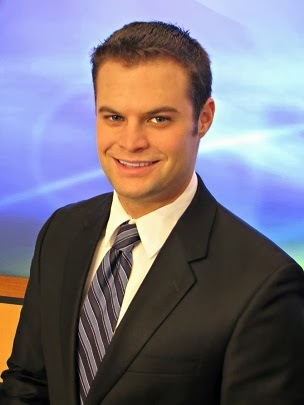 Carl joins 40/29 News from KULR in Billings, Montana where he’s been part of the forecasting and reporting team since his graduation from the University of Washington in 2011. "Brad’s addition creates the largest team of meteorologists in our viewing area and enhances our commitment to provide the most comprehensive weather coverage around the clock,” said KHBS/KHOG-TV News Director, Greg Shepperd. Carl joins Anchor/Reporter John Paul on 40/29 News Sunrise each Saturday and Sunday at 6:00 a.m. and 8:00 a.m. On weekdays Carl will report for 40/29 News Sunrise, the market’s top rated weekday morning news. * 40/29 News Sunrise on weekdays features anchors Kelly Johnson, Derek Burleson, meteorologist, Laura Huckabee, reporter Jonathan Rozelle and Washington D.C. correspondent, Hallie Jackson. KATV/Channel 7/Little Rock has dedicated its news studio to the late Dale Nicholson. Nicholson spent more than 50 years at KATV, three decades of that as general manager. A ceremony was held Thursday night at the station. A scholarship has also been set up in Nicholson's name. Watch the video of the ceremony above. Kevin Roth, 3rd string met at KSLA, has left the building for good. He reportedly has accepted a similar position in Dallas. Jessica Duff announces she is leaving THV and going to work for The Source 93.3. MMJ Max Siegel is also leaving. So is producer Stephen O. As reported on this blog months ago, high school football show Fearless Friday is moving to KLRT/Channel 16/Little Rock. The show in years past has been broadcast statewide on KARK/Channel 4/Little Rock. "Fearless" will be hosted by KLRT Sports Director Wes Moore with a 30 minute version at 9:30pm featuring live reports from games in Central Arkansas then at 10:30pm the program will cover games statewide. The 10:30pm edition will also be broadcast on Fox 24 in Northwest Arkansas. Meet KATV's newest reporter, Alicia Dover. KATV anchor Christina Munoz sat down with the Arkansas native to find out a little about her.